High up in the air above the treetops, the two Bald Eagle lovers look deep into each others eyes. They then suddenly twist around, locking their talons together and holding onto each other for dear life as they plummet to Earth, spinning, turning, and diving with wild abandon. At the last minute, right before the moment of impact, they release and soar again, high above the ground. Whew, it’s like the overheated prose of a romance novel. This is how we used to think bald eagles actually copulated, during this plunge, with wild, daredevilish abandon. The truth is, in recent years we’ve learned this to be false. The plunge is simply a playful flirting game they engage in during the mating season, sort of like human lovers writhing and undulating while dancing in a disco. After this high-flying foreplay, bald eagles go off alone and do what must be done in private. How Did the Bald Eagle Get its Name and Are Bald Eagles Really Bald? Where do Bald Eagles Build Their Nests and How long Does it Take a Bald Eagle to Build a Nest? 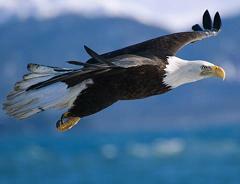 What Do Bald Eagles Eat and How is the Bald Eagle an Opportunistic Scavenger That Steals Food?